Although the weather was unstable and rainy the days leading up to Sunday, it turned out to be a rare sunny day in what has been a very wet week. It was fortunate we had such beautiful weather since there were so many people there that there were not enough space to sit outside, much less inside. 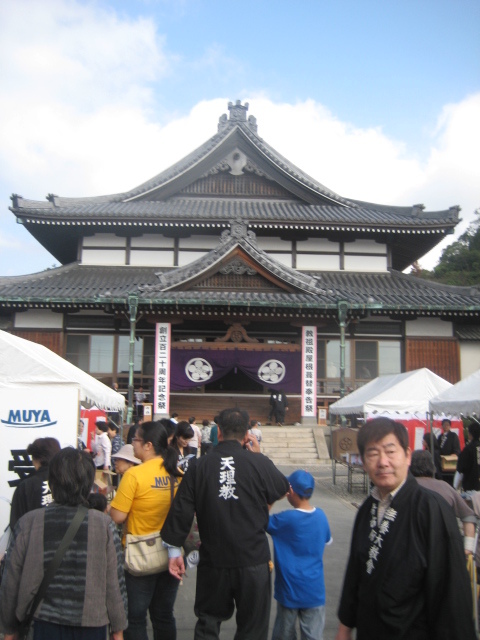 Followers of Muya (including some from Brazil) and the eight grand churches that it has spawned so far (Awa, Hofu, Kagawa, Kunina, Myodo, Nan’a, Shuto, and Takamatsu) were there, with some manning the several food booths that offered yakisoba, yakitori, udon, maguro sashimi, takoyaki, and more after the service. Before the service, the Shinbashira gave his congratulatory greeting. The statement that left the deepest impression with me was his instruction to those in the position of leading Muya Daikyokai that it was meaningless for the church to continue existing 200 to 300 years down the road if they ever lost sight of the mindset and resolve of those who applied for the establishment of Muya Shikyokai back in 1889. Thus, he urged those listening to continually remind and inform themselves of the “day of origin” that led to Muya’s founding. I wish I was able to take more pictures but it was an impossible proposition having to watch my rascally two-year-old. Nevertheless, it was a wonderful way to spend a Sunday! See The Footsteps of Our Predecessors, Part 52: The Path of Repayment to God for a short story on Unosuke Tosa (1855–1928), Muya’s first head minister. There is no greater joy and honor than for me to have the presence of the Shinbashira, Okusama, and the former Shinbashira4 in addition to all of you who have come to worship at today’s service commemorating the 120th anniversary of our church and the dedication of the new roof for our Foundress’ Sanctuary. Upon reflection, 40 years have passed since we last re-roofed the Foundress’ Sanctuary. Wind and rain damage from typhoons and the like have made the leaking of rain prominent as of late. Since this was truly unforgivable on our part to Oyasama, we decided to undertake renovations to correct this pressing matter. We received sanction to undertake the renovations last December and commenced renovations in February this year after temporarily relocating the symbol of worship and memorial tablets. Last night, the Shinbashira himself re-enshrined the symbol of worship in the altar dedicated to Oyasama and the memorial tablets of the Nakayama household.5 I feel truly unworthy that we have been able to welcome the dedication service today without incident. Further, when I turn my thoughts to today’s service that is being simultaneously held to commemorate Muya’s 120th anniversary, I cannot help but think about our day of origin when the establishment of this church was first sanctioned due to the sincerity and intense devotion of the first head minister and our other forebears. Since our founding, our successive head ministers have led the way for our elders to dedicate themselves single-heartedly to Jiba over a long 120 years. The thought of their sincere footsteps makes me feel the need to readjust my collar and brace myself for the road ahead. Although there may be no need to mention this, a service to commemorate an anniversary at a juncture of every ten years serves as an occasion for us to pledge to further our spiritual growth and have God and Oyasama see the results. I wish to utilize this auspicious day today to become ever more spirited so everyone present will together make firm strides ahead in our nioigake and o-tasuke efforts. In closing, allow me to express my deepest appreciation for your tremendous cooperation leading up to today.